[mp3 player with fm radio]: It can record the music you listen to from phonograph, tape drive, CD, DVD and mobile phone using our designated audio cable, and enjoy it again anywhere you like. This is not possible with other MP3 players. The MP3 player is also a portable radio with headphones. Independent radio IC design helps players get stronger signals. It can easily receive your favorite radio station. 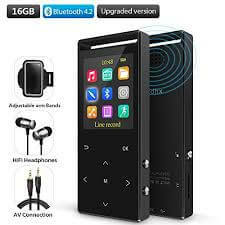 [MP3 Player with Bluetooth] When an MP3 player is connected to stereo or headphones, you can return to the main screen and find your favorite songs in the music file. In Bluetooth mode, you can get “bookmarks” or “restore work.” You can fast forward or rewind to select the part you want to listen to. The Bluetooth 4.2 MP3 player has better compatibility and lower power consumption. Long distance and automatic connection help MP3 players easily connect headphones and audio. [16GB lossless player]:16GB capacity allows you enjoying music up to 5000 songs. You can use the extra space to set up a new file to save a lot of files as well. It is HI FI lossless MP3 player with Equalizer, which can support playing Rock, Funk, Hip Hop, Jazz, Classical etc. It supports the below Audio Formats: Mp3/ WMA/ APE/ FLAC/ WAV/ AAC-LC/ ACELP. [4.2 pedometer and armband]:Using our sports armbands will give your hands free when running and will make music easier to carry. After you set up your user information, you can start to record the number of steps of your workout, the frequency of the exercise, the calories burned, the miles and time of the exercise. While you are using the 4.2version of the pedometer, you can also return to the main interface and listen to your music. Technology makes life easier and easier. [mp3 player with speaker]:Alarm and sleeping timer function are realized by the built-in speaker. Fashion design, gift wrapped, a best present for your friends.